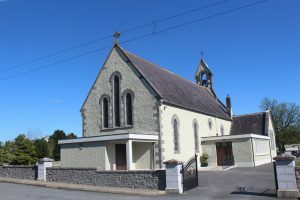 The parish of Crosserlough has three churches – St Mary’s in Crosserlough (Cros ar Loch), St Patrick’s in the village of Kilnaleck (Cill na Leice) and St Joseph’s in Drumkilly (Droim Coiligh). 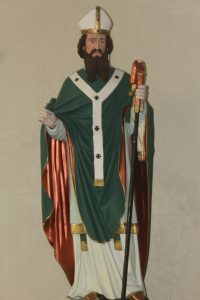 A native of Cullow townland, Fr John Boylan was instrumental in raising funds in Ireland, Scotland and most especially in the USA, for the building of the current parish church in the townland of Cullow. William Hague Jr. was employed as the architect. Construction of the Gothic church was completed in 1888 at a cost of £5,690. It was dedicated on 25th November 1888. Fr Boylan served as curate in Crosserlough from 1860 to 1866. He was appointed parish priest of Crosserlough in 1866 and ministered in the parish until his death in 1899. 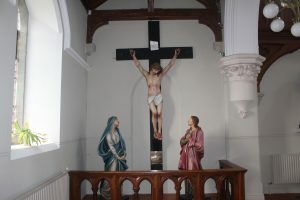 A significant internal and external reconstruction project commenced at St Mary’s in 2010 and the church was officially closed in June 2012 to allow for more substantial works to be carried out. 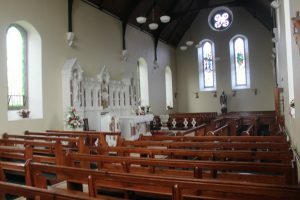 During the restoration work, Masses were celebrated in St Patrick’s Church in Kilnaleck. 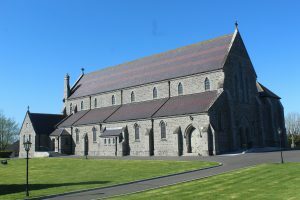 St Mary’s was rededicated in 2013 by Bishop Leo O’Reilly. 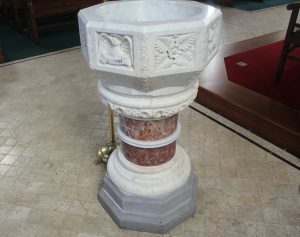 Many fundraising events have been taking place over the past few years in aid of the restoration of St Mary’s. These range from Family Fete Days to community walks/cycles and concerts. Crosserlough Drama Group has also been very active in raising restoration funds and it has staged many highly-rated productions in the ‘Old School’. Crosserlough Choral Society has hosted numerous Christmas Carol Evenings in aid of the restoration project. 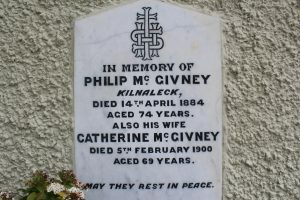 The site on which St Patrick’s Church stands was donated by Philip and Catherine McGivney. An article published in ‘The History of Kilnaleck – Old and New’ refers to St Patrick’s Church as ‘the church of the flagstones’. 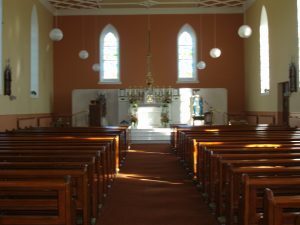 The church was constructed by locals to serve the religious needs of the villagers and the people of the immediate hinterland – in particular the inhabitants of the townlands of Coolkill, Mullycastle, Tonylion, Drumbee and Kill. The foundation stones of the structure were laid in 1882. 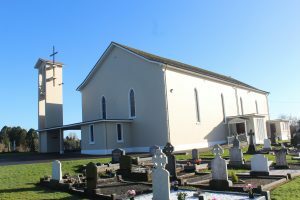 Dedicated to St Patrick, the exterior of the building is described in ‘Churches of the Diocese of Kilmore’ (2005) as modest in its design, while the interior is functional and intimate. In 1973, the orientation of the church was changed. The altar was placed in the middle of the church along the northern wall, enabling the congregation to be closer to the sanctuary area. Philip Cullivan was the architect and the builder was John Halton. The church and its immediate grounds were renovated in recent times. Irish scholar, Dr John O’Donovan, travelled around Ireland in the nineteenth century to ascertain the meaning of place-names and to gather other local information. He visited County Cavan in 1836. During his visit to Drumkilly, he noted the presence of a Catholic Chapel in the townland, adjacent to a corn mill. He also reported that a school was being held in the chapel and that it was established in 1824. The result of his research was published in the ‘Ordnance Survey Name Books’. ‘Lewis’ Topographical Dictionary’ of 1837 confirms Dr O’Donovan’s account and refers to the presence of a large chapel in Drumkilly. 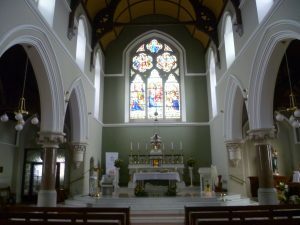 The current church, St Joseph’s, was built in 1846/47 under the pastorate of Fr John Murray. Funds released by Pierce Morton, Chairman of the Castlerahan Famine Relief District, helped to complete the project. 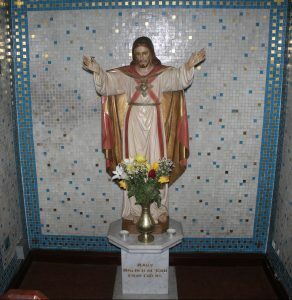 In 1861, Fr John Boylan renovated the church. A stone belfry was built adjacent to the church in 1876. During the 1930s, the church received a new ceiling. 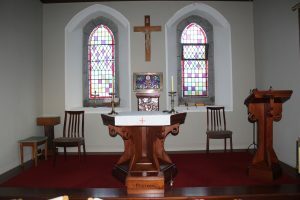 The orientation of the altar changed in 1968. 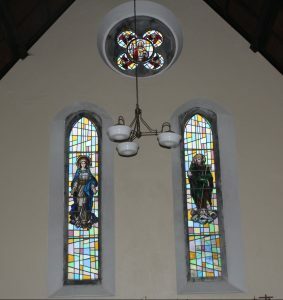 It was the first church in the Diocese of Kilmore to have the altar along the wall in the centre of the building. This change was undertaken in accordance with Second Vatican Council guidelines. The gallery was also removed during this renovation and the bell was transferred to the newly-constructed belfry attached to the church. The church was rededicated in October 1968 by Bishop Austin Quinn. 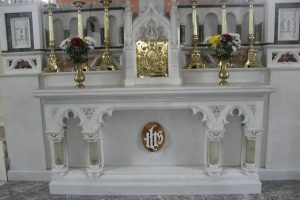 Fr Paddy Brady supervised the restoration of the sanctuary to its original position at the eastern gable in 2005. 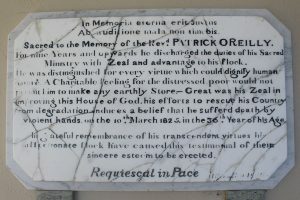 A commemorative plaque, dedicated to the memory of Fr Patrick O’Reilly, hangs on the wall at the front entrance to Drumkilly Church. Fr O’Reilly was ordained about 1815 and served in Drumkilly until his violent death in 1825. The plaque reminds Drumkilly people of Fr O’Reilly’s attempts to improve the civil and religious rights of his congregation, and the price he paid for doing so.